On January, 19th, we visited Polo Digital in Malaga, located in the Tabacalera historic buildings. The purpose of this visit aimed to demonstrate the new technologies that can be used in communication strategies, as this space is dedicated to new technologies and specialised in the solutions of Augmented and Virtual Reality. 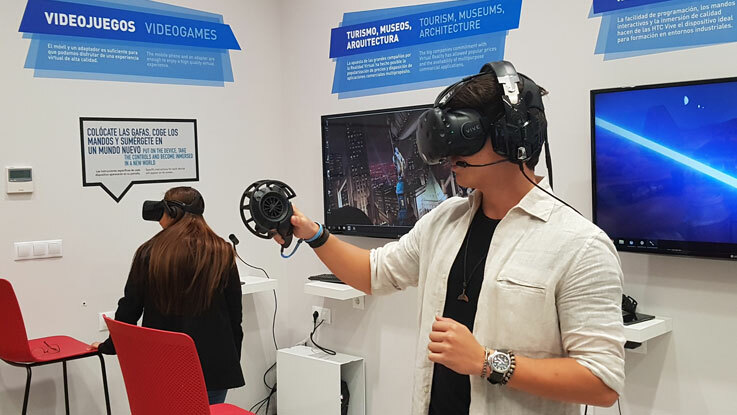 The whole experience was light-hearted, and our students could engage with the technologies and experience the fun inherent in virtual and augmented reality. We were immersed into a submarine and landed on a big-city rooftop, and people felt afraid to walk… We visited alternative worlds and gaming environments. We fought dinosaurs and became Jedis, rocking those lasers as we fought against the dark force. We experienced a virtual reality rollercoaster ride, which managed to thrill us without even leaving the room! We were part of a wedding party too, allowing us to appreciate new solutions for presenting services from an experience marketing point of view. The augmented reality experience offered us the possibility of seeing these kinds of applications in museums – with special glasses to see artworks related to the exposition and to increase our knowledge of the artist and the work of art itself. A 3D scanner allows the screening of architectural, artistic and service objects, adding augmented information to it. We saw TV´s that transported us to any world we wished, and tried out the augmented reality glasses that suddenly brought spaceships, planets and cosmonauts directly into the lab room. Additionally, we saw how augmented reality glasses work in factories to help workers proceed with, for example, the construction work, such as for Airbus, when placing additional information into the mechanical piece they operate. As well, we experienced technology that transported us to tourist site, offering us the chance to practice a variety of sports as if we were actually there. We had enormous fun and laughs, proving that this new technology is still overwhelming our senses and it is so new that this was an unique experience to try so many of them in just one place. We hope it will inspire us for our future work in marketing and communications, by offering our audience all this fun and feelings.